The company has ten departments. All Active Directory user objects are located in a separate organizational unit (OU) for each department. Each user belongs to a separate Exchange distribution group for each department. You need to plan the assignment of administrative rights for organization. A. For each department distribution group, modify the Managed By settings. B. For each department distribution group, modify the message moderation settings. 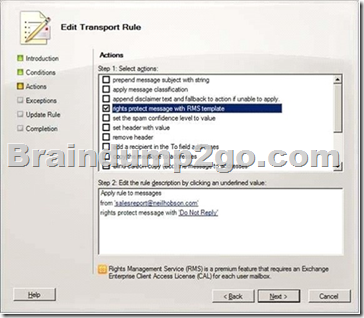 Mail Flow Settings tab is used to configure message size or message delivery restrictions for the distribution group. In Microsoft Exchange Server 2010, users can create and manage distribution groups and distribution group membership. These users are delegated ownership of the group by the ManagedBy property. The default owner of a distribution group is the user or administrator who creates the group. However, you can use the EMC or the Shell to change the ownership of a distribution group. To change members in distribution group you need to select in ADUC in properties of this group on tab Managed By select user and check Manager can update membership list. If the group is a distribution group if you set the Managed By property then they can manage the group members from inside Outlook. 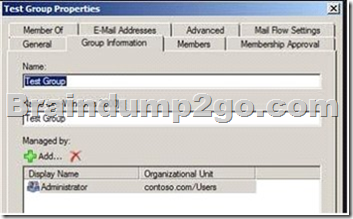 In Exchange 2010, distribution groups can’t be managed by groups – only individual users can manage groups. The MyDistributionGroupMembership management role enables individual users to view and modify their membership in distribution groups in an organization, provided that those distribution groups allow manipulation of group membership. You are the enterprise administrator for an Exchange Server 2010 organization. All users run Microsoft Office Outlook 2010. You are designing a sharing solution for your organization and a partner organization. The partner organization use Exchange server 2010. You have an Exchange Server 2010 organization that has Active Directory Rights Management Services (AD RMS) installed. The default Do Not Forward template is configured in way that the recipients can’t forward the message to anyone else, copy content from the message, or print the message. If the RMS rule can’t be applied to messages because an AD RMS server is unavailable, messages will be queued on Hub Transport servers. Depending on the volume of these messages, additional disk space may be consumed on Hub Transport servers. Exchange will attempt to IRM-protect the message three times. After these attempts, if the AD RMS server is unreachable or the message can’t be IRM-protected, a non-delivery report (NDR) is sent to the sender. Each office connects to the Internet by using a direct link. The main office connects to the branch offices by using a WAN link. You plan to deploy Exchange Server 2010 servers in each office. A. Create an Active Directory site for each office. Deploy two global Catalog servers in each site. B. Create an Active Directory site for each office. Deploy a single domain controller in each site, and then enable site link bridging. C. Create an Active Directory site for all of the offices. Deploy a global catalog server and a read only domain controller in each site. D. Create an Active Directory site for all of the offices. Deploy a global catalog server and two read only global catalog servers in each site. 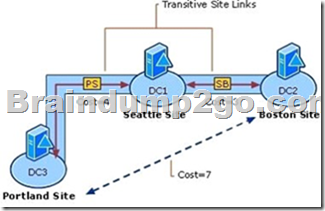 By default, site links are transitive, or “bridged.” If site A has a common site link with site B, site B also has a common site link with Site C, and the two site links are bridged, domain controllers in site A can replicate directly with domain controllers in site C under certain conditions, even though there is no site link between site A and site C. In other words, the effect of bridged site links is that replication between sites in the bridge is transitive. The setting that implements automatic site link bridges is Bridge all site links, which is found in Active Directory Sites and Services in the properties of the IP or SMTP intersite transport containers. By default, all site links are transitive. We recommend that you keep transitivity enabled by not changing the default value of Bridge all site links (enabled by default). Your network consists of a windows Server 2003 Active Directory forest that contains a windows Server 2003 enterprise certification authority (CA). Users access their mailboxes by using Windows Mobile 5.0 and Windows Mobile 6.1 devices. 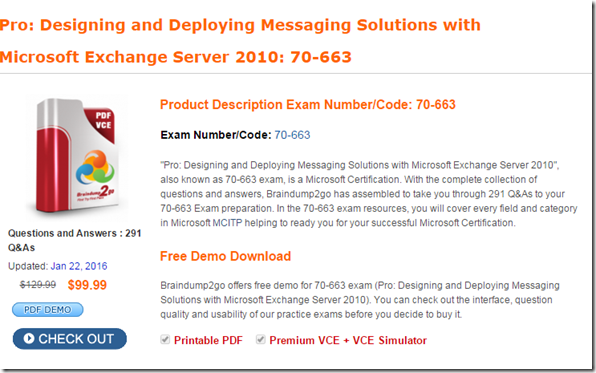 You need to plan a certificate solution for the Exchange Server 2010 deployment. The solution must minimize the amount of effort required to connect all mobile devices to the organization. A. Create a self-signed certificate and install it on the Client Access server. on the Client Access server. You plan to deploy two new Mailbox servers. Both Mailbox servers will be members of a database availability group (DAG). You need to recommend a hard-disk configuration for the new servers. Which disk configuration should you recommend? You plan to deploy Exchange Server 2010 on your network. You plan to deploy the servers configured as shown in the following table. You need to recommend a solution to deploy Mailbox servers. A. Deploy two Mailbox servers. Configure each server to have a RAID 5 array. B. Deploy a two-node Network Load Balancing cluster. C. Deploy a database availability group (DAG) that contains three members. D. Deploy a three-node Network Load Balancing cluster. Configure each server to connect to a Fiber Channel (FC) Storage Area Network. NLB is not supported with DAGs and 3-nodes will cost more money. So, the best solution is A. Your network contains two subnets named Subnet1 and Subnet2. Subnet1 contains all company servers. Subnet2 contains all client computers. Subnet1 and Subnet2 are separated by a firewall. Some client computers connect by using Outlook Any where and some client computers connect by using MAP1. 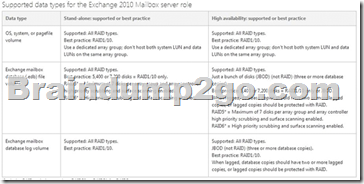 You plan to deploy the Exchange Server 2010 servers shown in the following table. You need to ensure that users can access their mailboxes and public folders by using Microsoft Office Outlook. What should you configure on the firewall? A. Open TCP ports, 80, 443, 135 and 1024 to 65535 from the client subnet to Server3. Open TCP port 25 to Server3. B. Open TCP ports 80, 135 and 1024 to 65535 from the client subnet to Server1. Open TCP port 25 to Server2. C. Open TCP ports 80 and 443 from the client subnet to Server3. Open TCP port 1024 to 65535 from the client subnet to Server1. D. Open TCP ports 441, 135, and 1024 to 65535 from the client subnet to Server1. “RPC Client access service” in the Mailbox server is used for only public folder access. When the outlook client queries for Public folders, it directly connects to the PF server (You can view it by checking the “Connection status” from outlook). This request is taken care of by the “RPC Client access service” in the mailbox server. Outlook clients inside your firewall access the Client Access server to send and retrieve messages. Outlook clients outside the firewall can access the Client Access server by using Outlook Anywhere (which uses RPC over HTTP). However, Outlook clients that are viewing or modifying public folders access the Client Access server by using RPC over TCP. By default the RPC Client Access service on an Exchange 2010 Client Access server uses the TCP End Point Mapper port (TCP/135) and the dynamic RPC port range (6005-59530) for outgoing connections, every time an Outlook clients establish a connection to Exchange. Connections to CAS: Autodiscover, OAB, Availability, Exchange ActiveSync (mobile), Outlook web app, Outlook anywhere access, POP/IMAP and now on top of all this now all Outlook users connect to CAS server too. The RPC Client Access Service utilizes the TCP port 135 EndPointMapper on an Exchange 2010 server. This behavior is by design. This port should be open along with the dynamic RPC range TCP 1024-65535 between your internal client network and the CAS Server or arrays and your Mailbox servers. Your company has a Active Directory forest. You plan to deploy Exchange Server 2010 servers in both sites. A. Deploy two Mailbox servers in each site. Install and configure continuous cluster replication (CCR). B. Deploy one Mailbox server in Site1 and one Mailbox server in Site2. C. Deploy one Mailbox server in Site1 and one Mailbox server in Site2. D. Deploy two mailbox servers in each site. Create two database availability groups (DAGs) named DAG1 and DAG2. Add the Mailbox server from Site1 to DAG1 and the Mailbox servers from Site2 to DAG2. CCR is non-existent in Exchange 2010 so the only viable solution is D.
With Exchange 2010, we no longer have the concept of Local Continuous Replication (LCR), Single Copy Clusters (SCC), Cluster Continuous Replication (CCR) or Standby Continuous Replication (SCR) for that matter. WHAT!? I hear some of you yell! Yes I am not kidding here. But to be more specific, only LCR and SCC have been removed from the Exchange Server product. CCR and SCR have been combined and have evolved into a more unified high availability framework in which the new Database Availability Group (DAG) act as the base component. This means that no matter if you are going to deploy a local or site-level highly available or disaster recoverable solution, you use a DAG. To make myself clear, with Exchange 2010, your one and only method to protect mailbox databases is by using DAG. Each office has a direct link to the Internet. Each branch office connects to the main office. Your network consists of an Active Directory forest. You plan to deploy an Exchange Server 2010 Hub Transport server in each site. Is it best practice to just have 1 send connector for the org and add all 3 of our servers in as source servers, or should we have 1 send connector for each site and just add the relevant exchange server in each site in as a source server. When entering the source servers in it did mention a warning about the send connector having servers in different AD sites. Currently I have just 1 send connector configured with all 3 servers added as source servers and it seems to be working fine. Some organizations wish to deploy complete end to end redundancy for their Exchange environment, including the outgoing routes to the internet. To achieve this most organizations will simply provision a backup internet connection for their network. This connection can either be activated during an outage of their primary link, or be configured as a secondary route that will be automatically used if the primary route is down. Although this seems like a simple win it can cause problems with email delivery because of IP reputation issues. A common misconception is that outbound email can be load-balanced for Exchange simply by provisioning two equal cost Send Connectors. 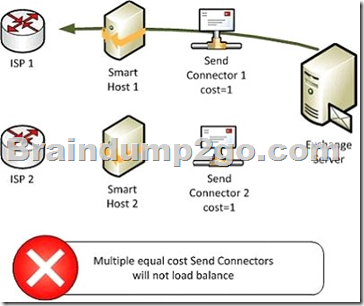 When the cost of the Send Connectors and the proximity to their source servers are the same, Exchange will simply choose the one with the alphanumerically lower connector name, and will not load balance the outgoing email across both connections. The correct solution is to deploy a single Send Connector with multiple smart hosts. If the smart hosts are on your own network then they are configured to route to the internet via their respective ISP connection. 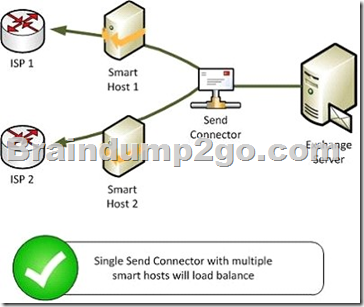 Or if the smart hosts are actually hosted by the ISP then the Send Connector simply specifies the IP addresses or DNS names of the smart hosts, and the Exchange source servers would need static routes configured to be able to reach each smart host over the correct ISP connection. Braindump2go 70-663 Latest Updaed Braindumps Including All New Added 70-663 Exam Questions from Exam Center which Guarantees You Can 100% Success 70-663 Exam in Your First Try Exam!